Natural light is the most sought after light in any architectural build. Its free and is mood uplifting. 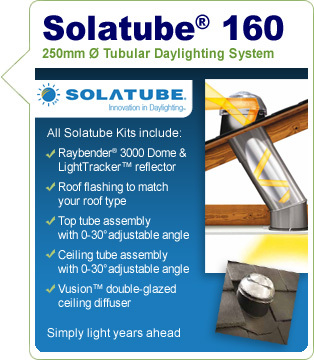 Solartube offer the most effective way to transform hard to light rooms; by capturing daylight from where it's strongest (the roof) and via a tubular system reflects the light into the required room. Multiple diameters, lengths and accesories mean that almost any room can be naturally lit. Each Solatube kit is provided with a "Raybender 3000 Dome", roof flasing, top-tube with 0-30° adjustable angle, ceiling tube assembly with 0-30Â°adjustable angle, "Vusion" double-glazed ceiling diffuser, seals, sealants and fixings. Installation requires climbing and working at dangerous heights. Use extreme caution to minimize risk of accidental injury and property damage. Installation should taken around about 4 hours. See the installation manual for a step by step guide. If the room in which you want to light does not fall in within a 30° angle of the roof dome 0-90° angle adaptor(s) can be provided. Although it should be noted that the more times the light bounces the more the light will dissipate. TierDrop: This optional decorative fixture is made from triple layered, frosted, tempered safety glass and offers an aesthetically enhanced alternative to the standard diffusers. Suitable for all 'twist fit' Solatube Brighten Up Series systems, either as retrofit or new. JustFrost: An elegant glass option for the most visible element of your Solatube Daylighting System, JustFrost is a single layer of frosted, tempered safety glass that will fit all 'twist fit' Solatube Brighten Up Series systems. Vusion diffuser: This diffuser has a subtle polycarbonate prismatic lens and complements all decors. It is supplied as standard with an acrylic white ceiling trim and is double-glazed to keep your energy costs down. OptiView diffuser: This optional, stylish diffuser uses polycarbonate Fresnel lenses to give you a view up the tube towards the sky, with stunning effect. Also double-glazed to prevent heat loss/gain. Flashing insulators are made from neoprene and help to reduce flashing condensation in cold conditions when the flashing may be exposed to temperature variations and humidity. The insulator is installed to the flashing base and the top tube slips through the opening to provide a barrier between the flashing and the potentially cold/damp air. Flashing insulators also provide a neat and professional finish to the underside of the roof void. An electric light kit is available for both the Solatube 160 DS and 290 DS. It offers the convenience of a switched electric light for night time use and reduces the need for two separate ceiling fixtures. The electric light fitting needs a minimum install distance of 400mm. The Solatube electric light kit can accommodate any Edison screw lamps up to 75W. To save energy, we recommend using low energy compact fluorescent lamps or our stunning LED lamp as shown (not a Solatube component). CE approved, the Solatube electric light kit carries a 5 year electrical component warranty. Electrical wiring should be undertaken only by a suitably qualified person. There may be times when you want to block out the daylight from a Solatube Daylighting System in a bedroom, for example. A low voltage electric daylight dimmer is available for the Solatube 160 DS and 290 DS that allows you to block out as much or as little daylight at the press of a switch. The Solatube daylight dimmer fits inside the tube, and butterfly valves, controlled via the low voltage wall-mounted switch, move to allow you to regulate the amount of daylight coming through the Solatube Daylighting System from fully open to fully closed, or any point in between. Tubed skylight to transform dark rooms to receive natural daylight.